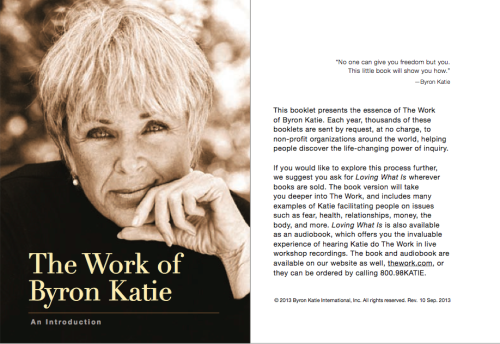 The Work of Byron Katie is a process of self-inquiry. It is a practical and profound method that can be used in many areas of life: relationships, children, family, work, illness, burnout, addictions, the craving for love and recognition, abuse, or simply a gnawing sense of discontent. It is a simple and meditative process. All that is required is a willingness to open the mind. As humans, we all know the suffering of believing our thoughts. Believing stressful thoughts has a huge impact on our lives and on our sense of wellbeing. Thoughts like these make us scared, angry, frustrated, disappointed or resentful – feelings that are the direct effect of holding on to the previous thought. What The Work shows us is that every form of sadness, anger, annoyance, despair or pain has its origins in thoughts that have not yet been investigated for their veracity. A thought in itself is harmless unless we believe it. It is not our thoughts, but the attachment to our thoughts that causes the suffering. This means that stressful thoughts will dissolve once we’ll start to examine them. We willll no longer have to meditate them away, jog, drink or eat them away, or fight against them. Neither will there be the need to develop “positive” thoughts or to make use of affirmations. That makes The Work such a powerful and radical tool. Is that really true? Which is more empowering? To brood over a lost job, to blame a former boss, parents, family members, to blame life, God or circumstances – or to have an open, creative and intelligent mind? Which one is more disempowering: to remain a victim of the situation, or to open up to where the pain is coming from? This doesn’t mean that we have to condone it or that we have to approve of harmful situations. It just means that we can see things without the confusion of our inner struggle. No one wants to have arguments in the family and no one wants to live in stressful conditions or have bad health. But is it really helpful to mentally argue with reality? Wouldn’t that add yet another layer of suffering? Once you will find your way in The Work, you may experience that old mechanisms dissolve, that space is widening and that your heart opens up in an effortless way. Your attitude to the circumstances may change and you may experience more understanding for others and for yourself. As a result, old battles will dissolve and life will flow effortlessly again. What you believe about yourself, others and the world can make you sick. What is true about you can heal everything. The Work consists of four questions and a couple of so-called turnarounds, which can be applied to all our stressful thoughts. By applying these questions we get to explore other perspectives of the same situation. The first step is to identify the thoughts with the help of a worksheet. Who would you be, or who are you without that thought? You can then turn the thoughts around in different ways, to see if the inverted thought could be as true or even truer than the original one. However, this so-called “knowing” does not resolve the stress. Have you noticed that? It doesn’t lead to a different view on life, or to a deeper understanding. When we meditate on the questions instead, we get to fully experience how a thought affects us and how it affects our body system, our relationships and our lives. In that we are able to feel the full impact of a stressful thought. 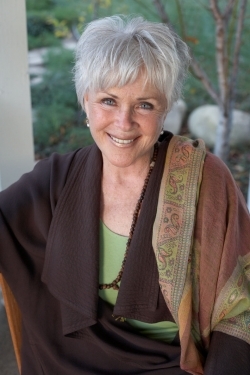 It is partly for this reason that Byron Katie offers the certification program, so that certified facilitators can offer others support in this inner process and help them to really get in touch with their inner world. When we start to get honest, the space between thoughts gets wider and wider. As I have said before, going through this process does not mean that we will become passive or apathetic. It is precisely when we do not lose ourselves in our thoughts and feelings that we will be able to act in an authentic way – out of openness and understanding. Through that, the contact with our loved ones, our colleagues and friends will become relaxed and natural. The Work is a process of self-inquiry. As a certified facilitator I know that each person who comes to me is wise, and will find their own answers, the ones that are true for them. I don’t offer any form of advice or therapy. I don’t offer a diagnosis. We don’t draw up any form of treatment plan. We simply investigate our thinking. The Work is not about substituting our negative thoughts by positive thoughts. It is not about becoming peaceful or about getting rid of our thoughts, even though inner peace and lightness of heart may start to flow as a result. The Work is about listening to our selves. When we do that, genuine insights can take root, and life can become natural and effortless again. Our 4-day private retreat in Aafke’s house in France has been such a blessing for us as a couple. We’ve both noticed a major shift in our relationship. We have worked on a subject that has been bothering us for years and which has led to a lot of mutual distrust. Now we are able to listen respectfully to each other. We are also able to take much more responsibility for our own thoughts and feelings, and we don’t blame each other for our unpleasant feelings so much anymore. Thank you, Aafke, for opening your lovely house in France for couples! My life has become so much lighter. And I can’t thank you for that, Aafke, as you never take credit, being a facilitator of the Work. But I’m going to thank you anyway, from the bottom of my heart. Aafke is a very skilled facilitator. She has lots of experience in The Work, and through her gentle and yet firm presence I have found the courage and the strength to do inquiry on some very painful issues from my past.Thank you, Aafke, for being so open, insightful, present and available.